With all these emerging new devices – from mobile devices, to wearables, to VR, to smart devices – having a proper bug reporting workflow in place becomes quite a challenge. Building web applications in particular might seem quite painful due to the different screen sizes of the used devices. It can even be worse than testing native apps for the Android ecosystem. In this post, I’d like to show you different ways of setting up your bug reporting workflow. Including manual, automated and crowd-sourced workflows. The What and Why of bug reporting. First things first. 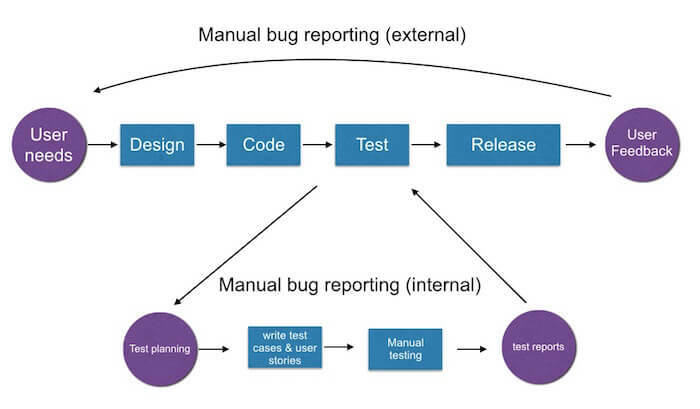 In order to understand the basics of bug reporting, we need to answer the questions of what bug reporting is all about and why it’s a necessary step in every web project. 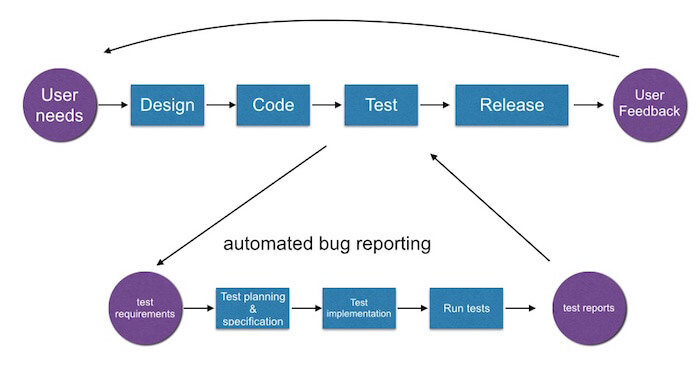 Bug reporting can be defined as the workflow used by quality assurance personnel and developers to keep track of software problems and resolutions. The result of the bug reporting workflow are so-called bug reports. Bug reports are the only tangible product of the testing process itself, solid technical documentation that describes a failure mode in the system under test that could affect the customer’s experience of quality. The short answer: Because we want to release bug-free applications and keep our users happy. Bugs and misleading errors can be found in nearly every software ever shipped on this planet, right? So how can we ensure a bug- and error-free software while developing it? Well, it’s time for some proper bug reporting. It’s time for bug reporting. User needs: Identify the user needs. As displayed in the workflow above, I’d like to distinguish between internal and external bug reporting. Of course this workflow might differ depending on your project- and team size. However, there will and should always be a project stage for internal testing (sometimes referred to as alpha testing) which includes bug reporting by web development and/or QA teams. Depending on your project and company, you’ll probably end up with one of the three following ways of bug reporting. If we take a look at automated testing or bug reporting, it’s all about setting up test cases which can be run without any human interaction. Automated bug reporting requires a comprehensive testing suite which enables you to execute pre-scripted tests on a web application before releasing it into production. There are currently great tools and workflow suites out there for running automated tests for your website or web application. On the other hand, manual bug reporting is all about making use of human manpower for testing your web application or website. It involves real human interaction for testing and reporting bugs and issues. Of course this also requires you to have access to a wide range of different browsers running on different operating systems. Both BrowserStack and Usersnap can be of great help here. BrowserStack: BrowserStack supports a great list of browsers and mobile devices for manual bug reporting. Usersnap: Testing on all different devices makes storing & managing all your bug reports a tough job. Usersnap helps you on this end by creating screenshots and storing all bug reports in your project dashboard, from whatever device you’ve created them. Crowdsourced testing and bug reporting – also known as crowd testing – is an emerging trend which makes use of the concept of crowdsourcing. 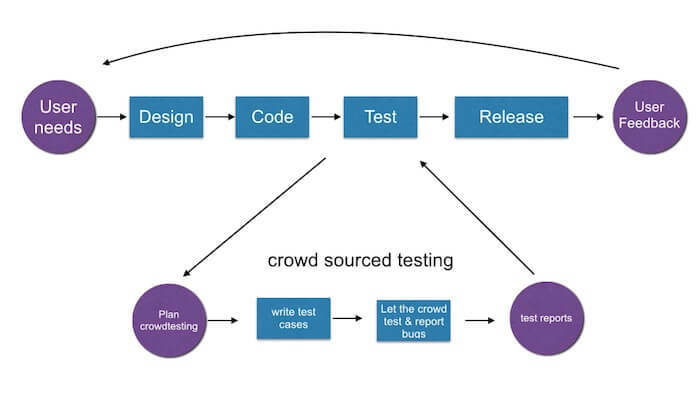 The difference of crowdsourced testing to manual or automated bug reporting is that it puts a web application or website to test in a mass of real different places. Basically it outsources your testing activities to a crowd of testers and bug reporters who put your product under the test. The great benefit of crowdsourced bug reporting can be found in the fast and reliable testing scenarios which you probably won’t encounter when testing your software on your own. Furthermore, this method is also considered as more user-centric because the crowd which is testing and reporting bugs brings an “outside”-view into your development team. Testbirds: Testbirds is one of the first crowd sourced testing sites with a straight-forward approach making use of their crowd. Pay4Bugs: The approach of Pay4Bugs is simple. When signing up for their crowd testing tool, you’ll only get charged when the their bug reporting crowd finds a bug. Applause: Another interesting crowd-sourcing bug reporting tool is Applause. It not only offers crowd testing for mobile and the web, but it also tests your application on wearables, smart cards and other devices. No matter which way of bug reporting you go, sooner or later, you will probably end up with the question of how to manage all your bugs. No one likes bugs, and reporting them can be quite tedious. That is why having a workflow in place to deal with bugs efficiently is crucial to building a bug-free website or application. The 4Ws of bug reporting! When bad bug reports happen to good people! How do you report bugs? Let us know in the comments! How to use Asana for bug tracking!